One of the very first Nigerian foods I tried was Jollof Rice. From the first bite I took I was in love. Jollof rice is sort of like Spanish rice, except it is made with tomato stew (Nigerian stew, of course), and has spices like curry, thyme, ginger and bay leaf. It is rich and flavorful! Many Nigerians also prefer it to be spicy, or have a bit of cray fish in it, but this just depends on who is cooking it. As I have tried to learn to make this myself, I have found that one of the keys to the best Jollof rice is actually the type of rice you use. We always buy Jasmine rice, which is long and fragrant when it is cooked. 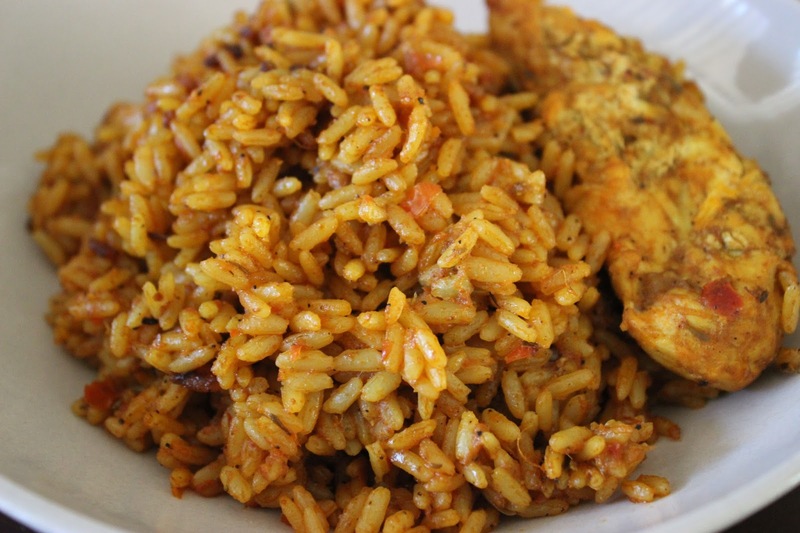 However, in Jollof rice, Jasmine tends to clump together and becomes too soft and mushy. My success has come as I began using Parboiled rice. Before meeting Nigerians, I had no clue what this was. Basically, it is rice that has been very briefly cooked (less than 5 minutes) and then rinsed to remove the excess starches. Luckily, you can buy parboiled rice, rather than trying to do it yourself. I get the Uncle Ben’s parboiled rice, which can probably be purchased in most grocery stores. Everything else for this recipe you will probably already have in your kitchen! I also chose to add cooked chicken before boiling the rice, so that the flavors of the rice would infuse the chicken. You can do the same thing with beef, fish or hard boiled eggs. This is completely optional though. We also usually serve Jollof Rice with coleslaw, which is especially good if the rice is very spicy. Heat the butter and oil in a large pot, over medium-high heat. Add half of the onion, in thin slices, and saute until translucent. Then add the curry, thyme, bay leaves and bouillon cubes. Saute until fragrant, then add the tomato paste. Continue to saute the mixture, stirring frequently, until the tomato paste looks dry. Meanwhile, put the tomato, bell pepper, ginger and other half of the onion in a blender and pulse until smooth. Once the tomato paste mixture looks dry, pour the blended tomato mixture into the pot, with the garlic, red pepper and salt. Saute this mixture, stirring frequently, until it becomes as thick as the tomato paste was originally (it should be a dark stew). As you first begin to saute, it may splatter a lot. You may use a lid between stirs, to prevent burns, until it thickens and stops spitting. Remove the pot from the stove and add the rice. Stir the rice until every grain is coated in tomato stew. Then pour the chicken broth into the pot, stir and return to the heat. This is the point when you may add any cooked meat into the pot. Bring the rice to a boil, stirring very little. Once boiling, cover with foil (to maintain the steam) and a lid. Reduce the heat to medium low and cook for 15 to 20 minutes until the rice is tender. Do not stir at all until the rice is done cooking. Once done, use a fork to fluff the rice and even out the remaining sauce. As you do this, remove the bay leaves and discard them. Instead of boiling the rice, you may also choose to bake it. Preheat the oven to 400 F. Pour the rice and stew mixture into a large baking dish and add the chicken broth. Bake for 20-30 minutes until the rice is tender. Then fluff the rice with a fork, and remove the bay leaves. You’re done! Enjoy your masterpiece! Lovey! Your blog is beautiful. Thank you for the mention!